“Symphony of Color” is indeed a mood-lifting experience. On display at the International Museum of Art and Science’s Clark Gallery, this exhibit is almost overwhelming in the perfection of its endeavor. 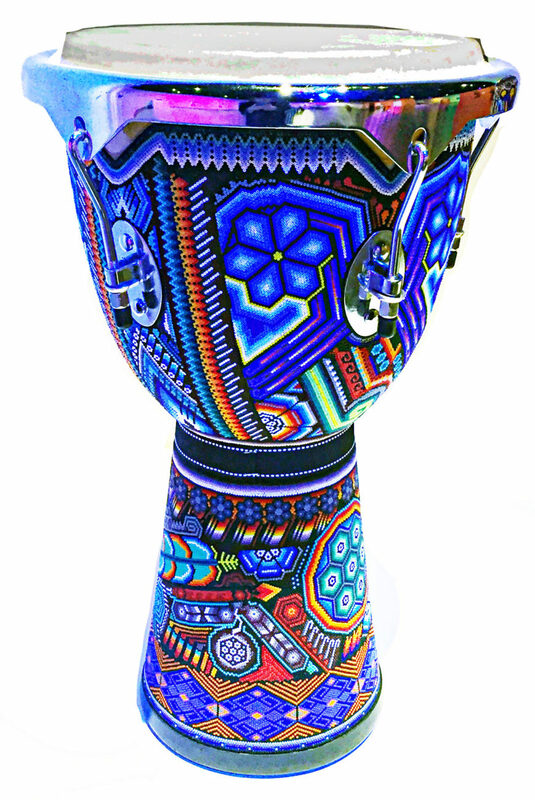 Forty actual musical instruments are embellished with Huichol, or Wixáritari, beadwork, creating effects that move the instruments into a realm of visual as well as audible sound. The colors and patterns used on the instruments convey lively rhythms and visual lyricism that uplifts through its beauty and spiritual meaning. We are shown the spirit of the music from the violins, guitars and other instruments through the skillful beadwork artfully pressed upon their surfaces by skilled artisans of Western Mexico. Across a far wall, speakers are mounted above each instrument, audibly relaying its music to the viewer. The entire effect truly produces a “symphony” of joyous music in tandem to the beaded colors. The color spectrum on each piece reinforces the jubilant sound, and colorful lighting effects add a special ambiance to the overall installation. It is estimated that about 18,000 Huichols, an indigenous people living in secluded settlements within Mexico’s Sierra Madre mountains, still reside there in the states of Nayarit, Jalisco, Zacatecas and Durango. Known for the beautiful beadwork that they adhere with beeswax to animal figures, masks and ceremonial bowls, artisans set hundreds of tiny glass beads in place one at a time, producing dazzling patterns derived from their ancestry and spirituality. The symbols and imagery in these bead paintings depict the world view of the Huichol. Looking closely at any of the musical pieces, one may find representations of the four principal religious deities descended from the Sun God-the Eagle, and the trinity of Corn, Blue Deer and Peyote. 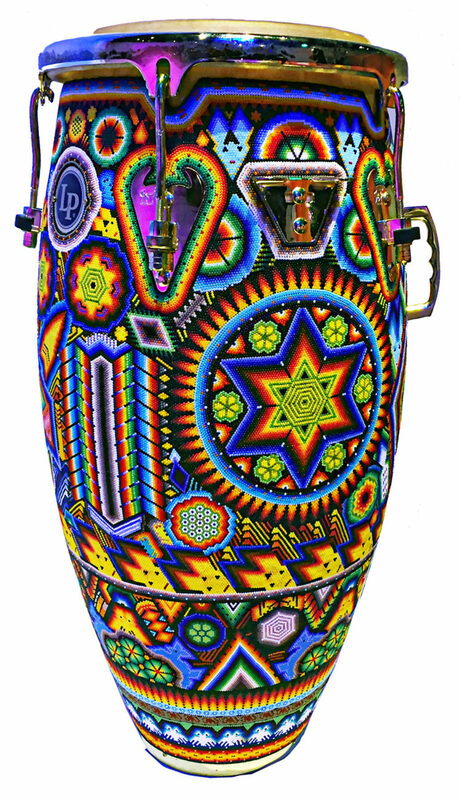 “The Sacred Hikuri Djembe” by Anselmo Hernández Robles prominently depicts a large blue peyote on the drum shape. On the lower section there are peyote patterns flanked by corn stalks. The pattern at the base repeats the four corners world view symbolizing its people at the center. The “Air of pride of their culture Double Bass” by Marcos Carrillo and family bursts with an amazing confluence of these symbols as well as the sun motif. The true beauty of this bead painting is that familiarity with the symbolism is not necessary for appreciation. The excellence of the craft and color sensitivity of the makers push these works happily over the top. I’m still amazed by the Tuba. 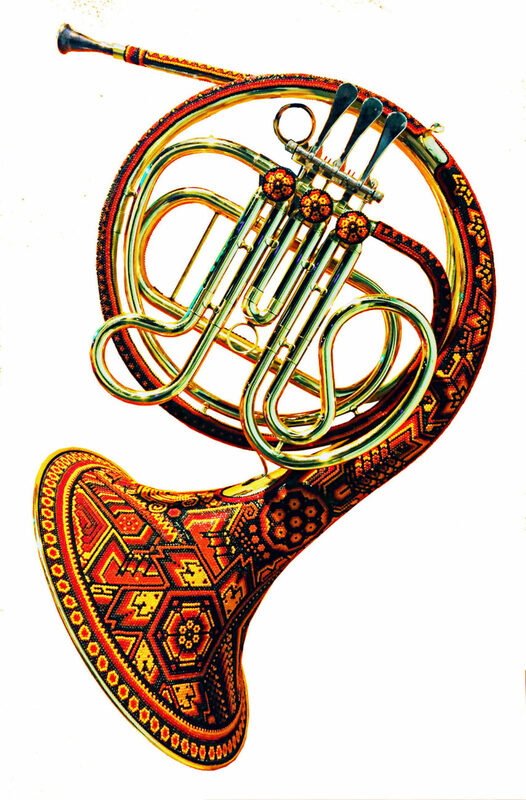 In 2006, Alberto Kreimerman, founder of Hermes Music, began creating “Symphony of Color” by the Hermes Music Foundation both in Mexico and the United Sates. He saw its purpose as helping the indigenous people and promoting Mexican culture. The Foundation followed a wave of movements formed to bring Mexico’s various indigenous groups into the global reality. The “Symphony of Color” project has supported and been supported by several Huichol families during the past 14 years, with exhibition support for this showing also supported by the Secretaria de Cultura en Mexico and the Festival de Música Contemporánea para un Mundo Mejor.